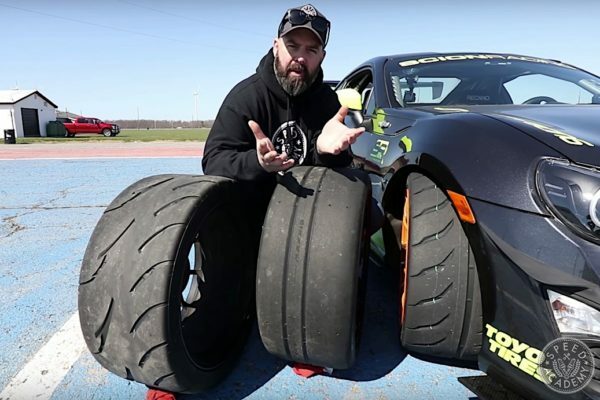 Last month we did a product spotlight on JE Pistons’ asymmetrical piston design, and while chatting with Sean from JE we were also impressed by the new (launched in 2012) Pro Seal lineup of head gaskets they’re now distributing. As Sean explained, JE was getting a lot of requests for head gaskets from their existing customers, so it just made sense to branch out in this area. What caught our eye was the unique rubber-like coating on these gaskets, along with the highly detailed embossing of its stainless steel outer layers. But before we delve into the details of Pro Seal’s head gaskets, lets quickly review what a head gasket does and how it does it. 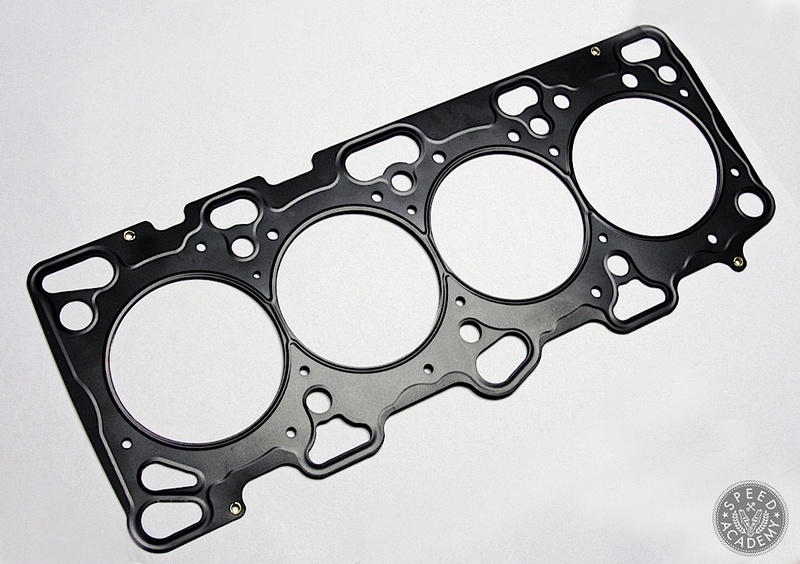 A Multi-Layer Steel (MLS) head gasket is made of three to five layers of stainless spring steel. It’s designed to seal the mating surfaces of the cylinder head(s) and engine block, ensuring engine gasses can only escape via the exhaust ports while preventing coolant and oil from leaking into the cylinders and combustion chambers. If you’ve ever suffered from a blown head gasket (Subaru owners, raise your hand! 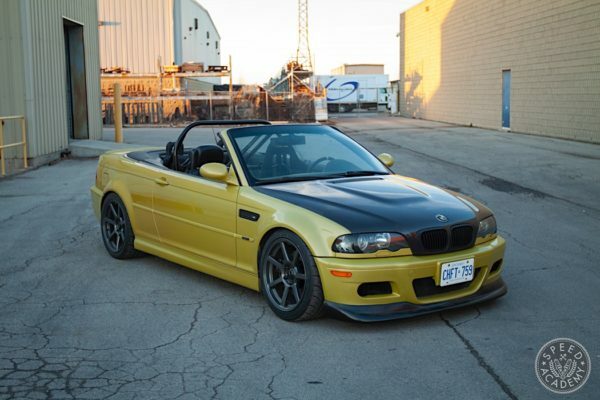 ), then you’ll know it’s a very serious problem that can cause rapid drop off in engine performance and even permanent engine damage in severe cases (coolant leaking past the head gasket and into the combustion camber will cause an increase in compression and the coolant will become superheated, warping pistons, rods and other components in the process). The outer layers of a MLS gasket typically has raised and sunken designs or relief built into it that help provide a seal in key areas of the mating surface, like around the cylinder bores and water passages. The durability of these embossed features is critical to the gasket’s performance, but more on that in a bit. 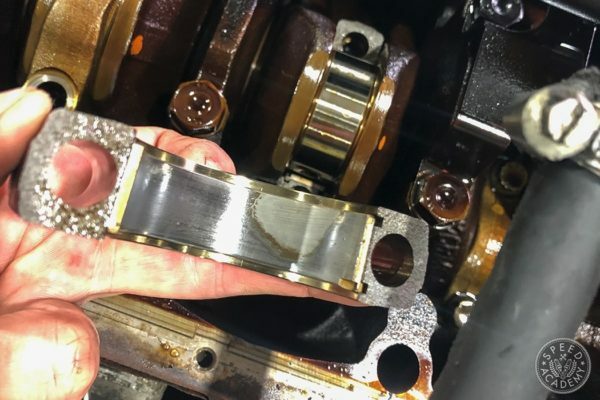 To maintain the seal when the head is pushed up and away from the block (which occurs as engine compression, RPM, and combustion pressure rise), a MLS head gasket’s inner layer(s) act like a spring, pushing the outer layers apart. The spring steel used is able to expand and contract without taking a permanent set or deforming under load, and it’s this elasticity or springiness that gives MLS gaskets their “vertical recovery” and allows them to handle high pressure applications. So that’s how a MLS gasket works, but it’s important to understand that not all MLS gaskets are created equal. 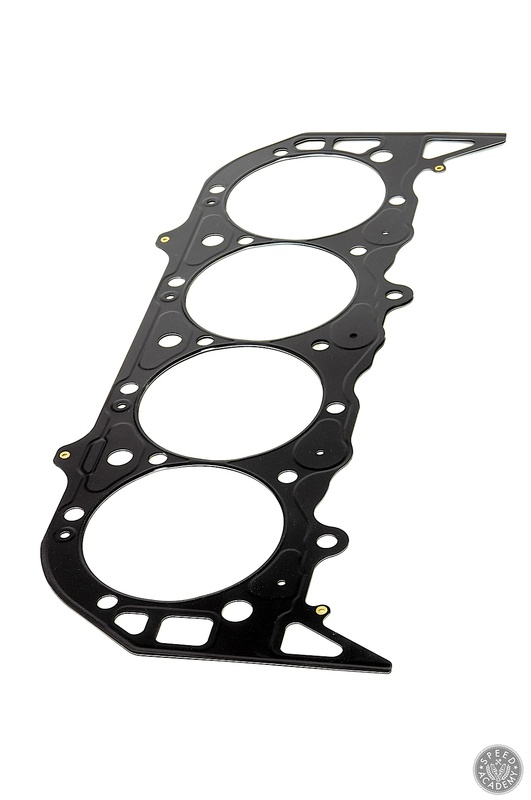 OEM MLS gaskets are designed for road use and the engine’s normal operating range, which typically results in cylinder pressure of no more than 1,000 psi. 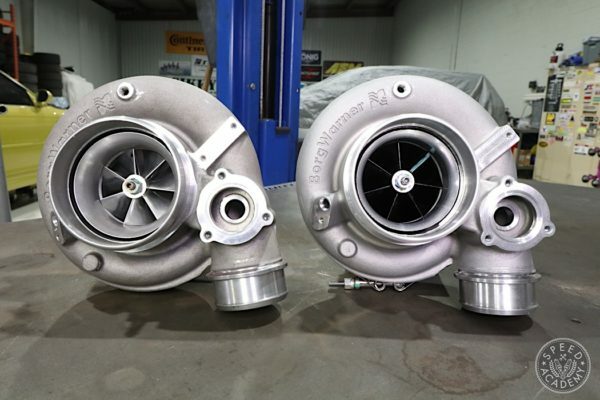 However, in a heavily modified engine or a race engine, cylinder pressures of 1,500 to 2,200 psi are the norm, and if detonation starts to creep into the equation that number can spike as high as 3,500 psi. And as you’d expect, the higher the cylinder pressure, the greater the lift or separation of the head(s) from the block is, so having a MLS head gasket designed to maintain its seal in these more extreme conditions is an absolute must. 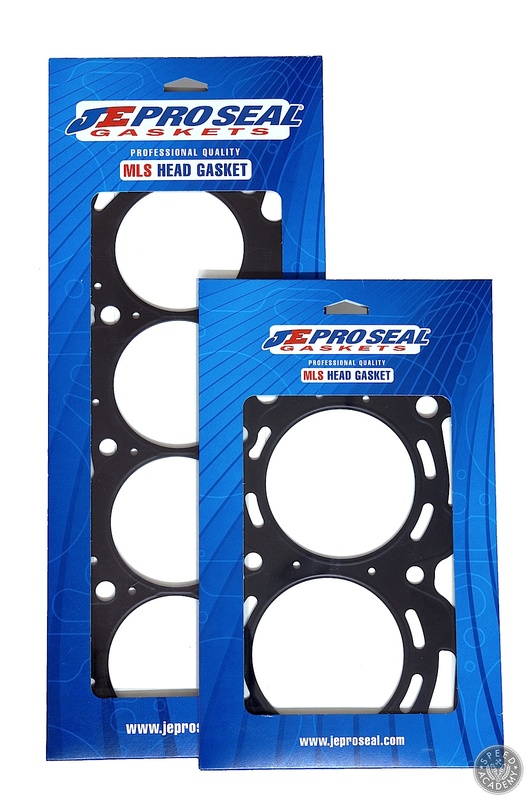 And that’s exactly where a premium racing head gasket like the JE Pro Seal version that caught our eye at PRI come in, since these are designed to perform in higher compression levels and combustion pressure levels. As you can see from the above comparison of the Pro Seal gasket (top) versus a less sophisticated MLS gasket (bottom), the Pro Seal gasket is achieving much greater surface pressure in that key area around the cylinder bores, as indicated by the red and yellow areas on the FEM analysis image, which indicate the highest surface pressures. In that same area around the bores, you can see the lesser gasket is showing far less surface pressure around the bores, other than a couple of little red and yellow hot spots. 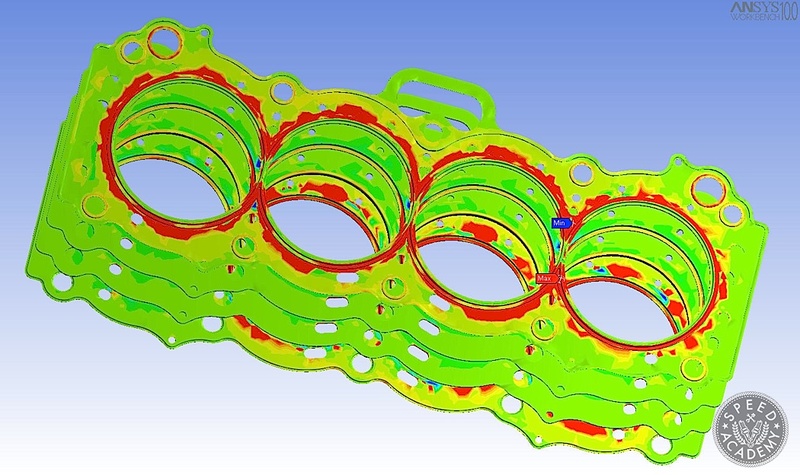 Some of the superior sealing and more evenly distributed surface pressure you see in the FEM image comes from Pro Seal’s unique embossment formation process, which uses soft radius forming to optimize the embossment radius in critical areas. You can really see this in the above image in those three raised areas between the cylinder bores along the top, where the edges drop off quite gradually. 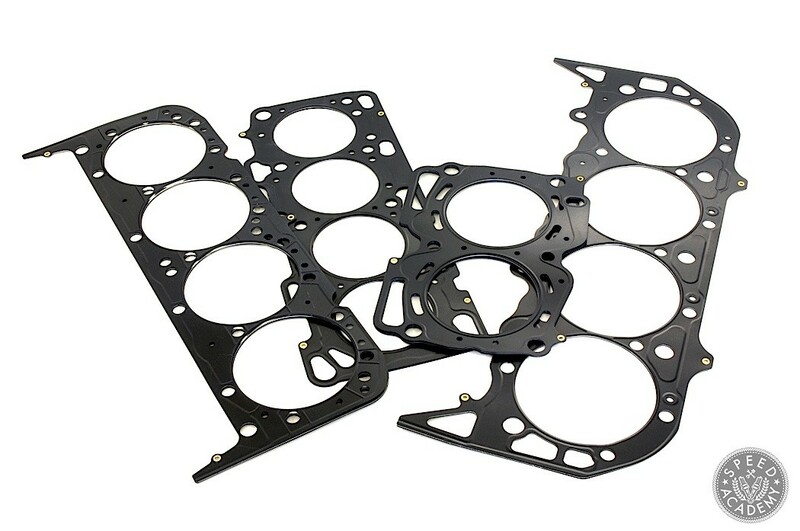 This improves gaskets conformability, reducing stress points, and provides more uniform clamp load distribution between engine block and cylinder head surfaces. The Pro Seal gasket’s superior surface pressure around the cylinder bores also stems in part from the use of a Gas Stopper layer (red highlighted layer), as opposed to conventional MLS gaskets which do not have this feature. The Gas Stopper is a stainless steel inner layer that uses an innovating “active fold” that you can see as a rolled end in the image above, which delivers a high pressure seal around the cylinder bore when tightening the cylinder head. It functions a bit like an o-ring, but without the need to machine the heads or block to accept it. The Stopper layer also helps prevent gases from leaking out of the combustion chamber even under prolonged high cylinder pressures, like those seen in race conditions. Plus its highly elastic in design, so the seal is extremely durable, too. You’ll also notice in the above profile images that the embossments (or raised section on the top and bottom layers) is smoother and in proper vertical alignment on the Pro Seal, while the more severe and out of alignment embossments on the conventional gasket can be flattened when the head(s) are torqued down, eliminating its memory function and reducing its performance. One of the things that jumped out at us when we first laid eyes on a Pro Seal gasket was how flat it lies on the table. That may sound trivial, but there’s actually a very good reason for it. Typically the springy nature of a head gasket and the forming induced stress they undergo during production means it looks kind of puffed up when you lay it on a flat surface, but because Pro Seal gaskets undergo a stress relieving process designed to temper the stainless steel layers, the gasket is more flexible, less brittle, and thus able to lay flat or relaxed. 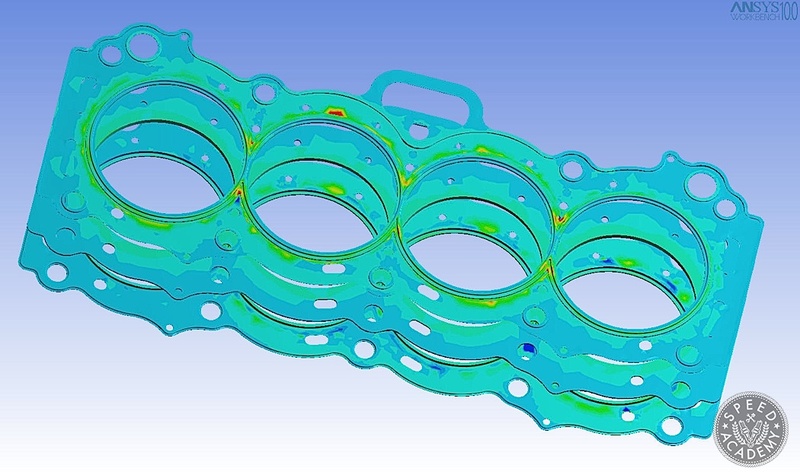 Plus the tempering process relaxes stress points that occur during the embossment process, all of which results in a stabilized gasket with less cylinder bore distortion and improved combustion seal around the cylinder bores. As for that unique rubbery coating that initially grabbed our attention, it’s a proprietary 4 step process that starts with a primer that helps the remaining coats adhere to the stainless steel outer layers (and all the layers are stainless with Pro Seal gaskets, unlike some of the competition). 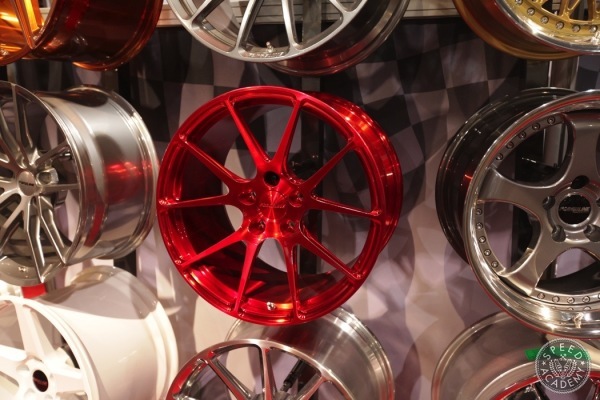 The second to last coating is a Viton rubber-like coating that helps with sealing, and finally a silicon coating as the final step, which is especially good at sealing off fluids including oil and coolant. You’ll also notice that the coatings cover the edges of the outer layers because it’s done after the layers are laser cut, embossed and stress relieved. This helps micro seal all the oil and coolant passages as well as the cylinder bores, further ensuring that gasses don’t escape the combustion chambers and oil and coolant doesn’t leak out of their passages. Plus the coating helps fill any irregularities on the block and cylinder head mating surfaces, and it also releases easily when pulling the engine apart so there’s no gasket corrosion or scrapping off old gaskets when it’s time for a rebuild. All in all, we’re extremely impressed by the level of engineering that has gone into these race quality MLS head gaskets from Pro Seal, and we’ll certainly be using a couple of them when it comes time to rebuild the FA20 in our FR-S race car (and available for all popular domestic and sport compact applications).